The NeverEnding Story leaves plenty to be desired, but the world and its inhabitants are nothing short of magical. The NeverEnding Story is Wolfgang Peterson's adaption of the German novel of the same name, one revolving around a fantasy world and the human boy who would enter it. The opening credits are set amidst the clouds where Bastian's head is clearly at in the beginning of the story. After a familiar "face your responsibilities" chastisement from his father over breakfast, Bastian is heading to school when he is chased by bullies into a bookstore. Inside, a curmudgeonly old man informs him the arcade is across the street. Bastian is a bookworm and knows that these "rectangular objects" are capable of transporting the reader into infinite worlds and just as many possibilities. When the shopkeeper tells Bastian of the dangerous volume before him, "The NeverEnding Story," which provides fantastic escapism but to the point of no escape, the lad "borrows" it and runs off to read it. For anyone who has a soft spot for fantasy, the opening description of a forest on a windy night where something sinister is afoot will get you giddy. It works its magic on Bastian and that's when the story within the story finally kicks in. We find ourselves in Fantasia (clever), a world threatened with the Nothing (cleverer) coming in like a storm and obliterating everything in its path. We meet some desperate parties: a rock-biting golem the size of a building, a hatter who rides a racing snail and a sniveling hob-goblin. Each of these initial and consequent creatures are a delight to watch and fulfill the promise set forth from the film's poster. That doesn't always happen (Bridge to Terebithia). The spectacles come with the realm and they do not cease: A boy leading a noble horse through the swamp of sadness, a hill that turns out to be a turtle allergic to youth and the (in)famous luck dragon who looks like he has some dog in his ancestral line. 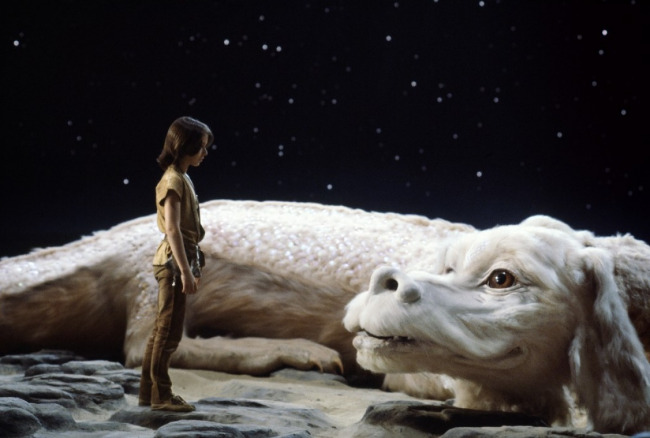 At the time of its making, The NeverEnding Story was Germany's most expensive film to date. The advanced puppetry and effects on display are enough to make even Jim Henson blush. The locales we visit along the way are a mix of impressive sets and fittingly found locations. The fate of Fantasia lies within the hands of a warrior child, Artreyu. Barret Oliver and Noah Hathaway play Bastian and Artreyu respectively. Along with Tami Stronach, who plays the Empress, we have three solid child performances for the price of one. They are also the most important characters in the story and it's no wonder the kid-centric film became so successful and popular. The proceedings are in accordance with the myriad of "chosen one" quests that have come before it, but finds some new territory when the line between the worlds is blurred. There's even an odd moment when we, the audience, are referenced and the film attempts to throw rocks at the 4th wall (a story within a story within a story). The predictability is not as problematic as the film's placid pacing. It feels like we're going through that swamp more than in just that scene. Then there's the utter lack of an ending, excused by the unhelpful narrator with, "But that's... another story."